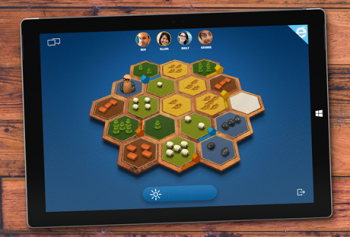 Microsoft is creating a virtual version of the popular tabletop game of barter trading, The Settlers of Catan. Currently playable in beta, Catan Anytime is a free, browser-based version of The Settlers of Catan in development by the Internet Explorer team. Designed for touch displays and playable on any device with a modern browser, Catan Anytime isn't even restricted to Internet Explorer as a platform - thanks, Microsoft! Catan Anytime is the result of a partnership between Internet Explorer and publishers of Catan, Mayfair Games and Bontom Games. The complete Catan ruleset: Development cards, Achievements, and Ports will be released at GamesCon in August. In the current beta - or preview, as they call it - you can play one turn before you have to register to keep playing. Features included in the digital version include auto-trade and auto-roll functionality, as well as email notifications for when you are away from the game. The Settlers of Catan has sold 20 million copies and is now available in over 30 languages. You can try out Catan Anytime right here. How do you feel about bringing asynchronous gameplay to The Settlers of Catan? I'm generally a fan of asynchronous play, but when a game has a strong social component, some of that human contact is lost, as is the magic of the game. Editor's Note: A prior version of this article implied that Mayfair and Bontom Games were the creators of The Settlers of Catan, rather than the publishers. The designer of The Settlers of Catan is Klaus Teuber. The error has been corrected.